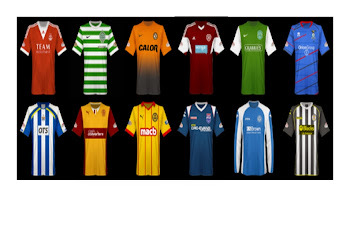 Narey's toepoker - a Scottish football blog: Top six or eleventh? As for the rest - well, your guess is as good as mine. At the time of writing, six points separate the other eight sides, from Ross County in fourth to Kilmarnock in eleventh. It's tighter than a hippo's thong. Three lucky clubs will get into the top six, while one will have to play a relegation playoff that is likely to be far harder to win than Motherwell's was last season. Given what we've seen so far in 2015-16, it seems bizarre that it's so close. Ross County haven't been out of the top six since the second game of the season and are in a cup final; Dundee have accumulated a talented (and, according to rumours I've heard, expensive) squad; St. Johnstone went on a great run before Christmas where they looked a match for anyone; Inverness have ten points out of twelve against Aberdeen and Hearts this season. In contrast - Partick couldn't score for fun in the early months; Killie and Motherwell chucked hopeless managers; it remains relatively surprising that Hamilton Accies haven't followed suit after a rotten run and a cup thumping at League Two Annan. And yet those top six places are up for grabs, and that dangerous eleventh place is still anyone's, at least unless somebody does a 2013-14 Hibs; several teams have threatened to do so at times, but at the time of apparent maximum crisis they always seem to pull out a result or two (see Motherwell at Tannadice on Tuesday night). Targets? Well, 44 points is nearly always enough for the top six - which would fit with the current points per game accumulated by Caley Thistle in sixth spot. Only once since the split was introduced has the team in eleventh managed more than 40 points so, like in the English Premier League, this should probably be earmarked as the target to survive. Of course, if one club could appoint Terry Butcher as manager and start playing Ryan McGivern in defence and James Collins up front, that would make life a whole lot more relaxing for the rest of us. So who is in good shape going into the last third of the season, and who isn't? Reasons for optimism: The Staggies are in the box seat, and have more points on the board than the others. They also have a genuinely decent squad, with forwards - specifically Liam Boyce - who can score goals. Reasons for pessimism: They could potentially be distracted by their cup final date; they also have a winnable Scottish cup quarter-final with Dundee United. The defence is their weakness, with only one league clean sheet since mid-October. Prediction: Fifth. Jim McIntyre is unlikely to let his players lose focus, and they have enough depth to compete on multiple fronts. It would be a surprise if they didn't keep their spot in the top half. Reasons for optimism: They're in good form right now, with only one defeat in the last seven. Their record against the teams below them is excellent, with only two defeats to the sides in the current bottom six. If their performance against St. Johnstone is anything to go by, they are flying in midfield and attack. Reasons for pessimism: Paul Hartley's side seem just as prone to bad runs as good ones, so logic dictates another dip is coming soon. Beyond their first eleven, there isn't a lot in reserve so injuries could take their toll. And they really would suffer if something befell the free-scoring Kane Hemmings. Prediction: Fourth. The Dark Blues look like the business just now. Besides, this was my pre-season prediction, so I'm going to milk it. Reasons for optimism: Caley Thistle are another side who have looked pretty good recently; their win over Aberdeen might have been their best performance of the season. Jordan Roberts' emergence makes them look far more dangerous going forward. Reasons for pessimism: The run of pre-split fixtures isn't kind - only three at home and trips to Celtic, Hearts, Ross County and Dundee - though their record against other top six teams this season is better than their record against the teams below them! ICT have been woefully inconsistent this season, mainly because of a ridiculous injury list, but that list ain't easing any time soon and they'll struggle if one or two more names are added to it. Prediction: Seventh. Being a natural pessimist, I reckon the tough run of fixtures will prevent the Caley Jags from staying in the top half. It would be a shock if they got dragged into the eleventh placed battle though. Reasons for optimism: The Perth Saints have tended to finish recent seasons strongly. After their recent bad run, it wouldn't be a surprise to see Tommy Wright go back to basics and grind out a few results - often what the team are best at anyway. And maybe they'll sign Julien Faubert, who is actually only 32. Reasons for pessimism: They've been guff recently - two draws and seven defeats from the last nine. The loss of Michael O'Halloran hurt badly and leaves them very short of pace in attack. The loss of Dave Mackay for the rest of the season leaves them short of an experienced head and a good defender when they really need one. The strikers have scored one goal between them in the last three months. Prediction: Sixth. Every time anyone thinks of writing off St. Johnstone, they come good. It's what comes from having a decent manager and a hard-working, disciplined squad. So expect Wright to turn this around soon enough. Reasons for optimism: Their veteran spine - Stephen McManus, Keith Lasley, Stephen Pearson and Scott McDonald - will be a boon if they are once more battling to avoid a playoff spot. They're coming off a big win in a high-stakes game at Tannadice. Reasons for pessimism: McGhee still hasn't found his best XI or formation - unless his ugly (according to the man himself) tactics against Dundee United turn out to be the way forward. The record since his return in October hasn't been much better than that of his predecessor. Prediction: Tenth. This 'Well side aren't much better than a year ago, but other sides are sufficiently worse that they'll stay up without the stress of a playoff. Reasons for optimism: They have games in hand on everyone else. Take away their dodgy August and September, and their subsequent points total is superior to anyone else in this article. And they've got Kingsley to scare the life out of opponents. Reasons for pessimism: It seems certain that midfield stalwarts Stuart Bannigan and Abdul Osman are offski - will they down tools if a big move is secured early? The Firhill pitch starts to resemble a farmer's field at this time of year, and often hampers their passing play. Prediction: Ninth. In each of the last three seasons, Partick have spent only a handful of weeks in the top six - all in the opening weeks of each campaign. I don't think they've got quite enough to smash through that ceiling this time. More likely is that they guarantee their survival relatively early and take their foot off the gas. Reasons for optimism: They've tightened up in the last few games, with four clean sheets in five. (There's only been one goal in those four games, mind, and they've been so rotten to watch that it makes your eyes bleed) In Ali Crawford and Gramoz Kurtaj they have two excellent creative midfielders, and Dougie Imrie continues to work like a Trojan. Reasons for pessimism: They've won just twice since the end of September, for a start. Canning's record as manager, aside from a wee purple patch at the start of the season, is honking. The strikers are all goalshy, and none of their centre-backs look up to Premiership standard. Reasons for optimism: A new manager is surely worth some sort of bounce, yeah? (don't say that to Dundee United fans). Killie have plenty of attacking talent, and that artificial Rugby Park pitch doesn't do their home advantage any harm. Reasons for pessimism: Lee Clark needs to sort out the back line, pronto. Kilmarnock have been prone to defensive blunders all season, and the heads tend to go down when they fall behind. Their next four games are against the top four. And most of teams above them have games in hand. Prediction: Eighth. Sounds crazy maybe, but I reckon the Clark appointment will give them the short-term boost they need to climb out of danger. Deila: a question of perspective? Will no treble mean trouble for Deila?